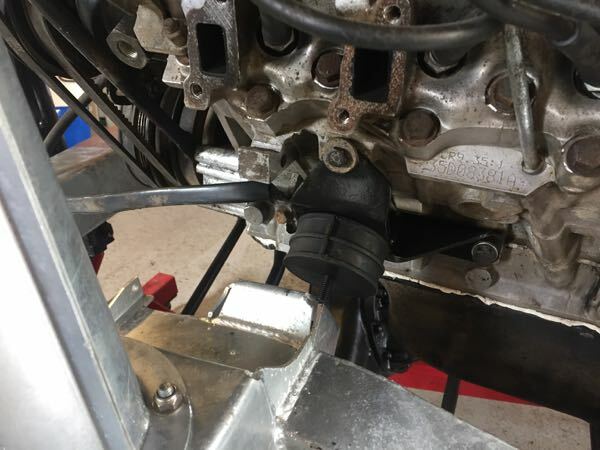 I'm rebuilding my 90 on a Richards V8 chassis with a 3.9l EFi V8 which I took out of a Discovery but have come across a problem dropping the engine in. I've got the Discovery LT77 v8 bell housing, an Ashcroft built long stick v8 LT77 and the disco transfer box. At the gearbox end I've used the Defender mounts which is fine as it should keep everything in the right places for the tunnel and props. At the the engine end, I'm using the Discovery engine mounts which seem to land about 2.5" too far back to meet the chassis mounts. Any ideas what I need to do? Are there different mounts for a Defender V8? Any help appreciated - Thanks! P.S. I promise I'll start a promise rebuild thread soon! The bell housing is longer on a v8 disco. 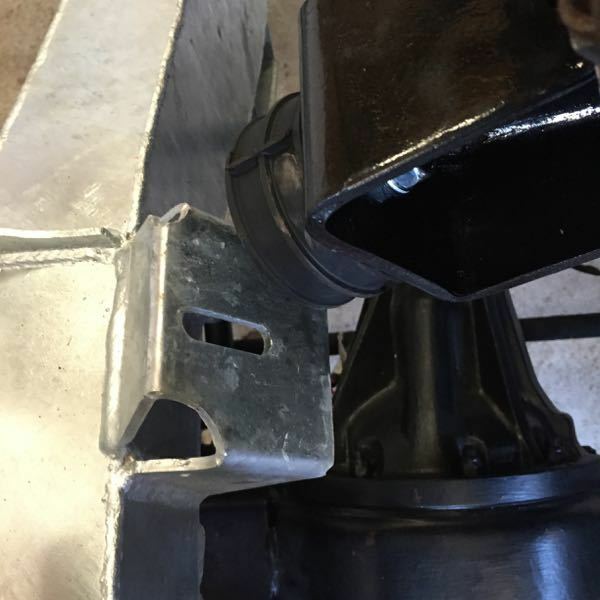 You have done right in keeping the transmission in the same place as it now means you only have to weld on new engine mounts. Mine were £43 posted from Richards chassis. Hmmm. 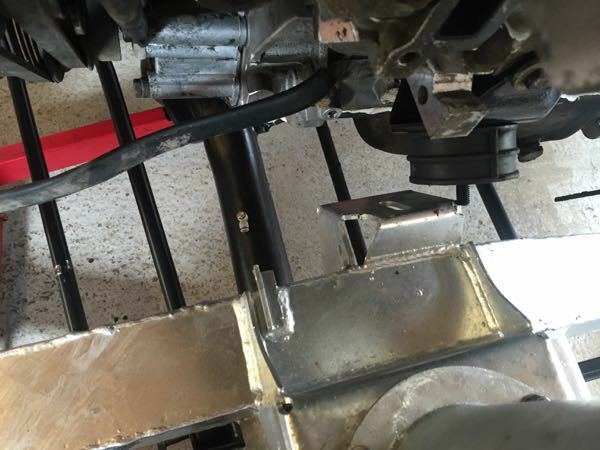 The problem is you probably won't want to weld the galv chassis. 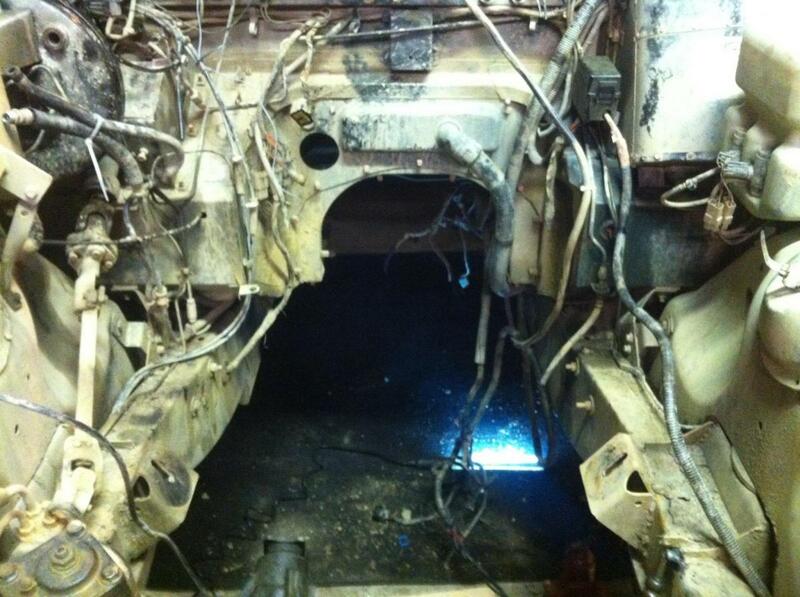 I was forced to weld mine as my galv chassis was originally for td5 engine. Try and locate a def v8 bell housing, though they may be like rocking horse ****? Ah yes I didn't see that. 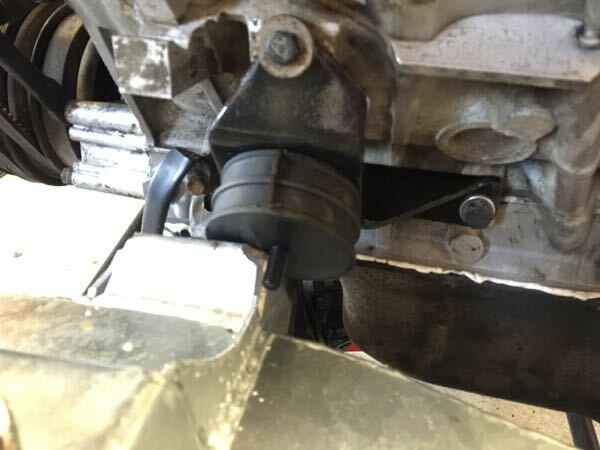 It's not just a matter of using a defender bell housing as the input shaft would be a lot longer? 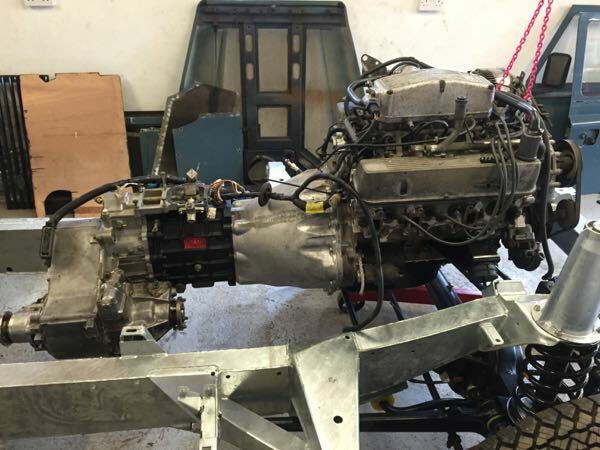 The gearbox was built by Ashcroft Transmission for me using as a range rover v8 long stick and long input shaft LT77 which I think were actually fitted to Defenders for a short while after the end of LT85 and some bits form the disco LT77s to make it a bit more modern... In theory (so I thought) this should put the the sticks in the right places and allow the props to fit back on. 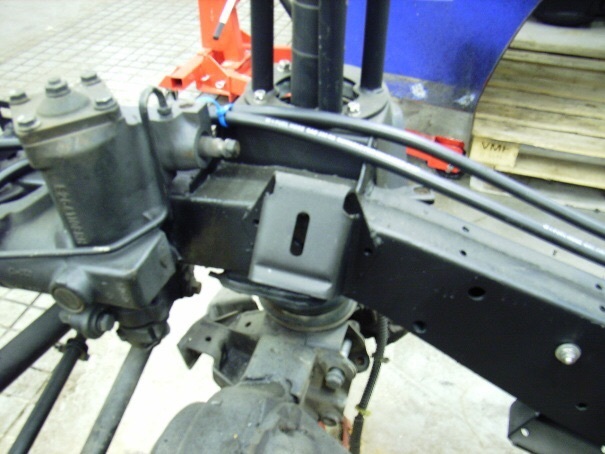 The bellhousing is the disco LT77 one which is 30cm long. Not sure if there is a different type for Defenders? This one does seems to be the right length for the 'long' input shaft and it mated ok with the flywheel etc. It certainly looks a lot longer the at the 4 cylinder one I used to have. More photos in case they help shed any light? 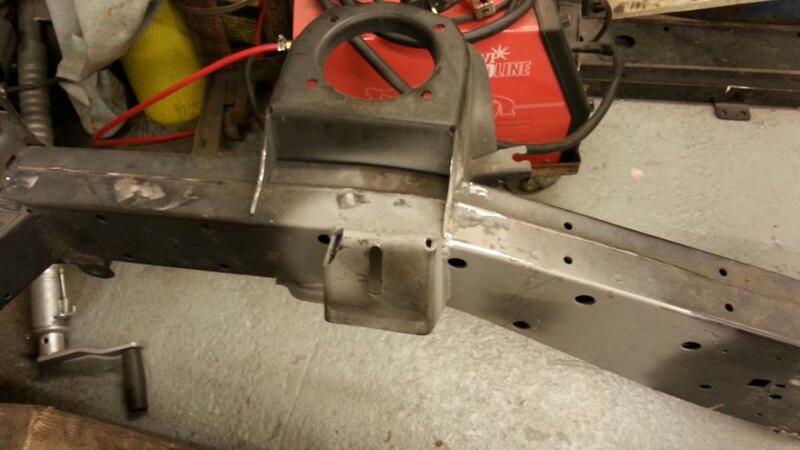 Yes, not keen to weld the galv chassis for both reasons of future proofing rust and my rubbish welding skills. I guess I need to modify the engine mount brackets to extend them forward slightly? It would be good to know where the v8 engine should sit relative to a reference point on the chassis in anyone knows? I'm just slightly south of Diss. You? Have you bolted up your props to make sure gearbox is in right place? Good question about the props so I went out and checked. The original 90 props fit which is good. Interestingly the slimline disco front prop that I kept seems too short which is a shame as I think the extra clearance past the exhaust is needed. Looking at n4s pics my engine mounts look in just the same place so I reckon I have lost exactly 2 inches somewhere in the disco v8 bell housing or my LT77. 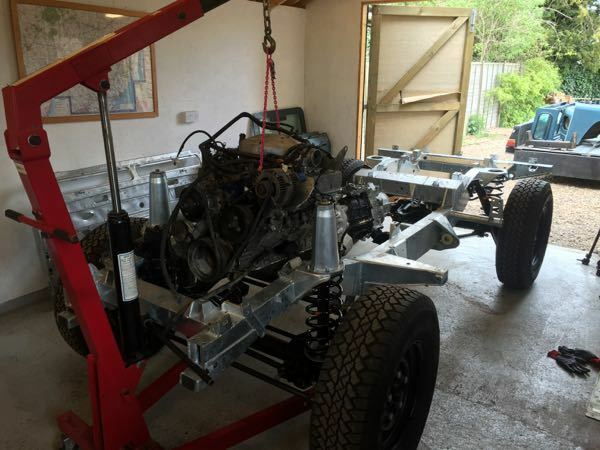 I have just gone from an old chassis with a 3.5 and long stick lt77 to a new chassis with 3.9 auto. . 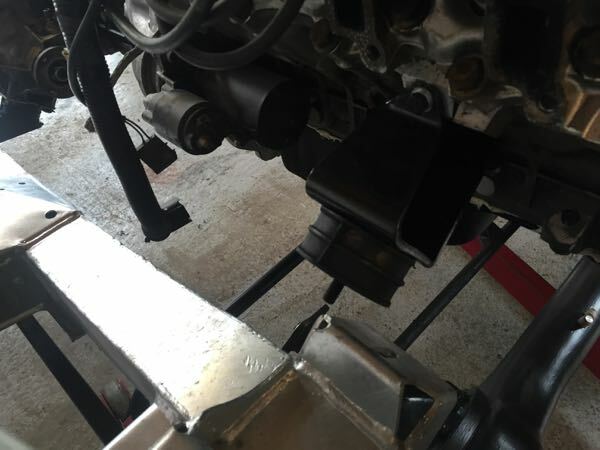 I welded the engine mounts where the factory v8 ones were fitted and it all bolted up ok.
interestingly if your disco front prop is too short surely that means that the engine needs to be moved forward. . The question is. What combination of engine and box did you have previously? ?. if you've come from a 300 that's why you're wrong. The 300 & 200/v8 props are different lengths. . I hoped and expected mine to work out just like yours. Don't suppose you have or could find a reference dimension for where your engine sits relative to the chassis or where the gearbox mounts are. I'm wondering if the gearbox I've had built is somehow 2" short? The 90 was originally a 2.5 petrol so LT77 so the same props as 200tdi era vehicles. The new chassis is a Richards V8 specific one. The Disco was a 1993 3.9 with LT77s. I'm also wondering if could have tried the original props on back to front, disguising the possibility the engine does in fact need to come forward and the gearbox mounts are wrong? I used the gearbox mounts from the donor discovery. ..
will try to remember to upload pictures when I'm not on the phone! Photos would be create. The lt77 with engine sat 2" back looks like where I'm headed. I might be wrong but I don't think lr ever used an lt77 behind the v8 in a defender. .. moving the gearbox forward may well mess up the tunnel etc. moving the engine backwards will mean non standard hoses and exhaust etc.. Correct. LR used either LT85, LT95 or Auto as standard. I had heard a rumour that some 50th anniversary models were fitted with the R380 but unsure if this was ever confirmed. I've heard they did use the LT77 for a brief period in between the Lt85 and the R380. Would be interested to have look at one of those! What I was basically getting at is that you're trying to use a combination that wasn't used . Therefore mounts may not exist to achieve your goal. .. or very rare if they do. ..
Yup. That's exactly where mine are Ron. Though my mounts look a bit more beefy than yours for some reason. Are those genuine mounts your using? It doesn't matter if the lt77 was used for a short period if it was mounted to a lt77/v8 short bell housing. If you move the gearbox you will still have to move mounts, your just changing what mount is moved. Doing this will also mean your props won't fit and your shifter is somewhere near your elbow. You are left with 3 alternatives; find an lt85 and short bell housing, mod the bracket that bolts to the block or cut the bracket on the chassis and re weld one in the correct place.